Ages 4 through 12. Here is a collection of activities, games, and reproducible worksheets for improving auditory comprehension and memory skills so that children with language disabilities can function more effectively in the classroom learning environment. Cut and paste activities give children "hands-on" learning experiences as they follow your directions for creating puppets and pasting objects on picture worksheets. Short stories, games, and other high-interest activities are included. The activities also strengthen language concepts. Listening to Picture Stories. Stories are presented orally and the students are asked to respond to questions about the story content. Thinking questions are included that require students to relate the events of the story to real-life situations. Students are also asked to retell the stories. Fun with Incomplete Stories. Students are asked to listen to short stories, to respond to questions, and to create their own story endings. Figure It Out. Students are presented with descriptions of situations and asked to respond to questions related to the events that occurred. Students are also asked to solve problems based on the information presented. What's the Word? Students are asked to listen to short stories in which a noun is described. Students must use contextual information from the story to identify the noun. 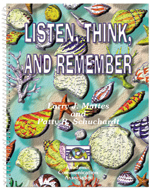 In Part 2 of the Listen, Think and Remember, students are presented with tasks that require them to follow directions or to recall specific information from conversational interactions. The activity "What Did You Order? ", for example, requires students to pretend that they are in a restaurant. After listening to the customer's order, the student must state what was ordered. The activities in Listen Think and Remember build oral communication skills, listening skills, and verbal reasoning skills that are relevant to classroom academic standards.